Choose from a selection of 99 holiday rentals in Krk. Use the search form to the left to filter the results and pick your choice of self catering accommodation in Krk. We have a good selection of holiday apartments in Krk perfect for family, single, romantic and group holidays. 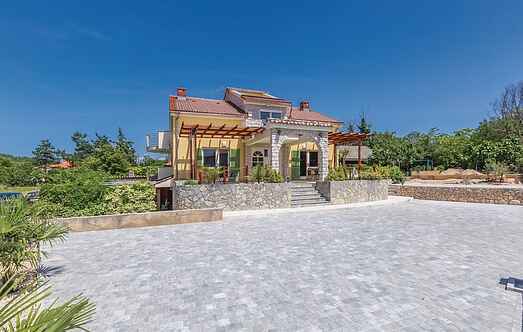 You may prefer to take a look at our listed holiday villas in Krk or holiday apartments in Krk. Find your holiday homes by a specific type using the property type drop down in the filter. Filter the holiday homes in Krk by a specific area using the area list above. In the town of Krk, in an apartment building, on the first floor are located this simply furnished apartments. In the back yard of the building there is a garden with a shared barbecue. These spacious and functional holiday apartments with a shared external swimming pool are situated in a large house. This gorgeous holiday house with heated pool is located in the small place of Brusići on the largest island in Croatia, Krk. These functionally furnished holiday apartments with balcony or terrace are located in a quieter part of the town Krk. There is also a shared barbecue on a covered common terrace. This beautiful holiday home is located in the small village called Saltić on the Krk island that is also known as the Golden Island or the Cradle of Croatian Culture. These beautiful holiday apartments are located in the small fishing village of Pinezići, on the island of Krk. The interior is wonderful and comfortable. This bright holiday apartment with a beautiful garden is on the ground floor of a residential building.